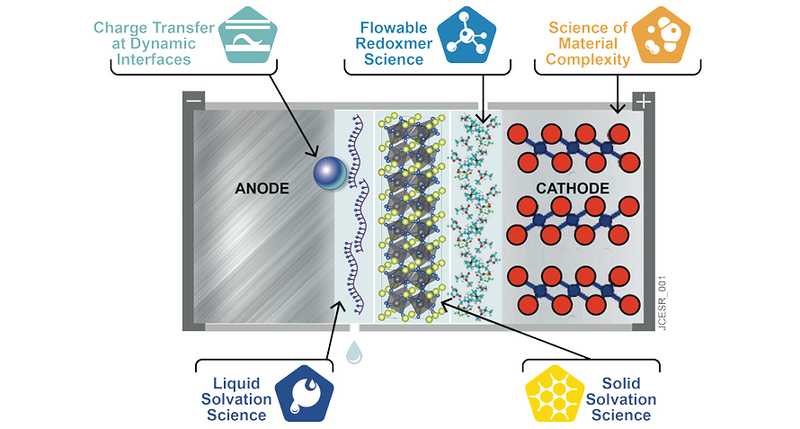 a single research organization was created to integrate the people, ideas, and tools to transform battery science with designer batteries. Transformative energy storage systems rely on the seamless integration of many constituent components. Indeed, key attributes of battery systems such as lifetime and safety are not simply functions of the individual components in isolation but rather emergent parameters based on the collective interactions among these components across multiple length and time scales. Each of the five JCESR research Thrusts pushes the boundaries of scientific understanding of a key aspect of energy storage systems. When the Thrusts work together, integrating research and outcomes, JCESR can invent whole systems tailored to specific applications. JCESR has two Research Integration Leads who are responsible for identifying and promoting cross-thrust efforts that create critical knowledge, reveal compatibility challenges, and lead to scientific breakthroughs. This integrative function investigates system properties that arise from bringing advanced materials together, ensures rapid communication among the Thrusts, and maintains research coherence across the Hub. Model systems, all in the beyond-lithium-ion framework, serve to create a common platform for the research across the Thrusts, further increasing the cohesion. When the Thrusts work together, integrating research and outcomes, JCESR can improve and invent whole systems tailored to specific applications.